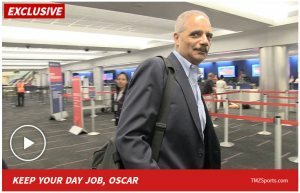 TMZ SPORTS -- Oscar De La Hoya's political aspirations aren't exactly being met with thunderous applause in D.C. -- where former Attorney General Eric Holder sucked the air out of the boxer's Presidential plans. Remember, Oscar came on "TMZ Live" on Monday and said he was launching an exploratory team to see if he could get the support he needs to make a serious run for the White House. Oscar said he's dead serious about running for Prez -- and feels that if Trump could do it, why not him? Fast-forward to Holder ... who could hardly believe we used the words "De La Hoya" and "President" in the same sentence. "Oscar De La Hoya? I think he's be a better fighter than he could be a President," Holder said. It gets better -- watch Holder's reaction when we bring up Donald Trump. He didn't have an official comment -- but his reaction said all you need to know.